If you’ve bought a hot dog or a beer at Safeco or CenturyLink Field, the person at the stand may have been homeless. Wednesday was Andrew Ritts’ first day at the Frozen Rope, a food stand in Safeco Field specializing in root-beer floats and huge ice-cream sandwiches. The game was still in the first inning when Ritts served his first pint — a Hop Valley IPA. “That’s a beautiful pour,” the customer said. Ritts grinned. He is 26, from Orange County, California, and looks like a surfer — long hair, blue eyes and a trimmed beard. “It was a beautiful pour,” he agreed. It’s unlikely that any of Ritts’ customers would suspect where he slept when he got off work that day — the Salvation Army emergency homeless shelter in downtown Seattle, where Ritts sleeps almost every night. 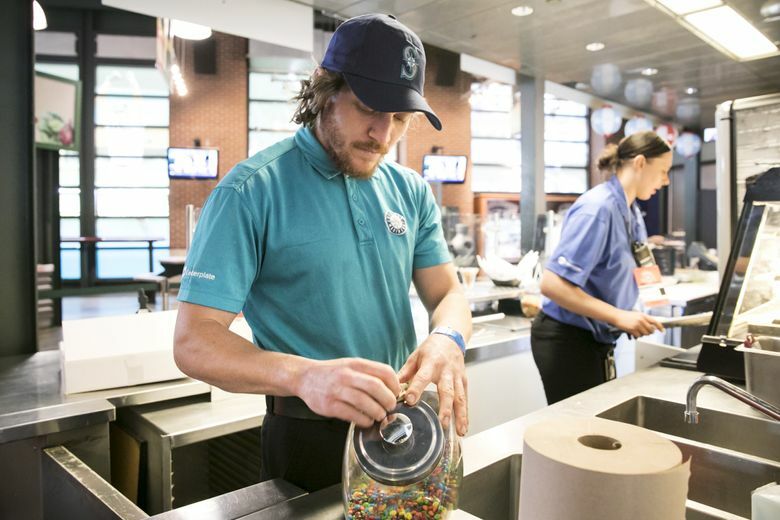 Ritts was one of 27 workers at Wednesday’s Mariners game from the Millionair Club’s temporary work program for people who are homeless, or who would be if it weren’t for the work. 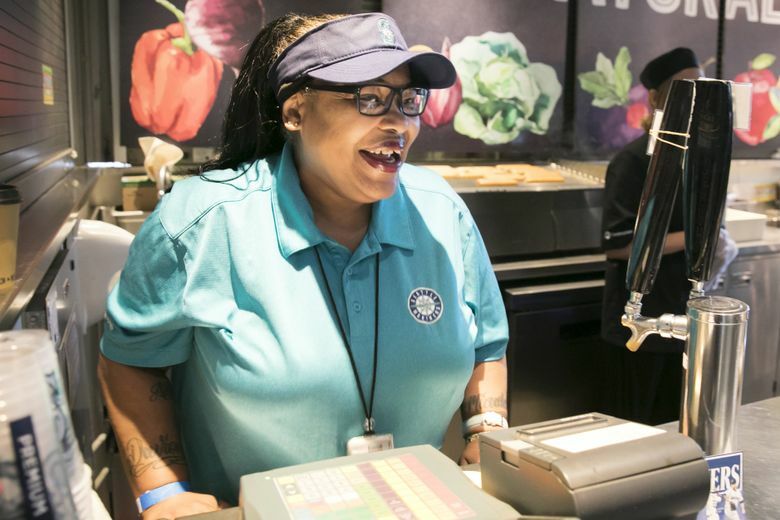 While most concession-stand workers are full- or part-time employees of Centerplate, Safeco’s food vendor, on big game days concession stands fill positions with workers from Seattle’s Millionair Club. 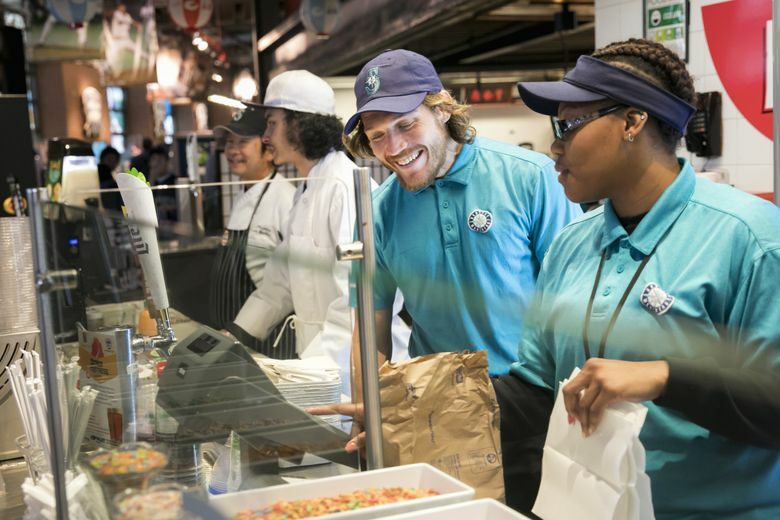 Millionair Club workers are behind the counter at Mariners, Sounders and Seahawks games. On the Mariners’ opening day this season, 65 Millionair Club workers were there — some of them training the other new employees. At Seahawks games, the Millionair Club has had up to 300 workers pulling drafts and selling food. While there are other work and training programs for homeless people in Seattle, the Millionair Club is both a temporary work agency and a nonprofit offering meals, showers, and a laundry service for homeless people. These two things usually don’t intersect at all, according to a recent report from the Heartland Alliance, one of the Midwest’s biggest antipoverty organizations — even though there’s plenty of academic evidence that holding down a job and keeping a roof over your head go hand-in-hand. Millionair Club workers got 342 full- and part-time job placements last year, but the club’s solution to homelessness does not get talked about a lot. Programs like the club around the country don’t usually get public funding unless they’re geared toward veterans or people with disabilities, according to Amy Rynell, senior director of the research and policy at the Heartland Alliance. Lost employment was the top cause of homelessness cited by homeless people in a survey during King County’s 2017 snapshot count of homelessness. Asked what they needed to get housed, people listed work just after rental assistance. When these programs work, they work really well, says Marguerite Kennedy, the Millionair Club’s development director. Andrew Ritts left Orange County in November, looking for a place to get away from the people he felt kept pulling him into drug use, and start fresh. Ritts heard there were jobs in Seattle, so he traded work hours at a bike shop for a fat-tire bike, and started his journey up the Pacific Coast. He arrived in Seattle on Jan. 26 and stayed that night at a temporary shelter in Seattle’s City Hall. He was working his first day at a different temp agency when he heard about the Millionair Club. The club opens early, right after Ritts usually has to leave the shelter; it serves hot breakfast and lunch Monday through Friday; and Millionair Club workers are paid $14 an hour. And best of all in Ritts’ mind, the charity pays for an alcohol-servers’ permit. Steve Dominguez, Centerplate’s general manager at Safeco Field, considers homeless or insecurely housed workers an asset. They don’t cause any more problems than other temp workers did, and the Millionair Club pushes workers to get to work on time and to eventually get hired, he said. Soon after he walked through the doors of the Millionair Club, Ritts met Ian Downs, the Millionair Club’s director of social-enterprise development and the guy who fills the orders from vendors. Ritts has some personality quirks. He’s fairly certain he’s under surveillance, although he believes whatever’s watching him is benevolent. And Ritts quickly proved himself, working at jobs around the Puget Sound. The Millionair Club fills jobs in Microsoft cafeterias, Tom Douglas restaurants and janitorial departments for low-income housing, as well as seasonal gigs, like taking down the swimming-pool bubble at the Mercer Island Country Club. In less than two months, Ritts got tapped to work at Safeco. Only the top 2 percent of Millionair Club workers get places at Safeco. It’s the cream of the crop, according to Downs. After Wednesday’s shift, Centerplate asked Ritts to come back for the rest of the week’s games. That means somebody noticed him, Downs said. “I think we’re actually making some headway into figuring out what the future looks like for Andrew — and how he can find gainful employment,” Downs said.